Example A: Sponsor decides to give awards in two categories: Service and Civilian. Section 2 provides definitions for eligibility in these two categories. Example B: Sponsor decides to give awards in three categories: Service, Civilian, and Junior. A Service Junior is required to enter the Service category. 4) Combination of One or More of the Above: Probably the most common awards plan and the most popular is one that provides a combination of open, class, and category awards. All competitors are divided into classes and then each is divided into categories. Awards are then given in each class/category, as well as to the top (open) scoring competitors overall. The program must clearly state how many competitors must be in a class/category for an award to be given and how class/categories will be combined in the event there are not enough competitors. 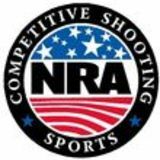 It is highly recommended that categories be combined before classes so that competitors of different categories are competing with others of the same skill level rather than with the shooters in their category but of higher skill. If all categories within a class are combined and there are still not enough competitors to give an award, classes can be combined. 5) Special Awards: If there are insufficient entries in a category to warrant separation of classes into categories, the sponsor can provide an overall category award and all competitors in the category would be eligible for the special award unless otherwise indicated in the program. 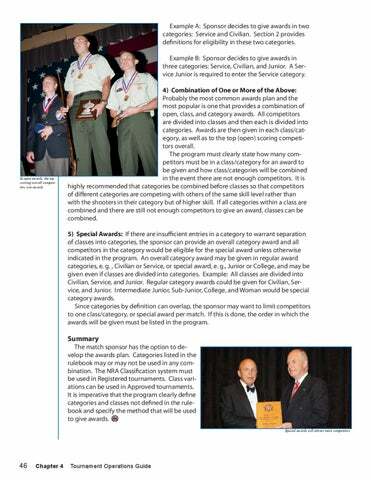 An overall category award may be given in regular award categories, e. g. , Civilian or Service, or special award, e. g., Junior or College, and may be given even if classes are divided into categories. Example: All classes are divided into Civilian, Service, and Junior. Regular category awards could be given for Civilian, Service, and Junior. Intermediate Junior, Sub-Junior, College, and Woman would be special category awards. Since categories by definition can overlap, the sponsor may want to limit competitors to one class/category, or special award per match. If this is done, the order in which the awards will be given must be listed in the program.